Crouzet puts in place a project team that provides you with a partnership of experts throughout all your program phases: drawing up the specification, feasibility, development, performance, testing, control of pre-production, optimization of logistical parameters, long-term support for the design and product tracking. After first contact, our business engineers will work with you to identify your goals and your constraints in order to draw up a product performance specification and to take in account the key factors of success for your projects. Our laboratories are equipped with facilities for testing all our products from design to production. Either with simulation or real-life tests (electrical, mechanical life and environmental withstand), our products are validated, tested and tracked throughout the project development process. 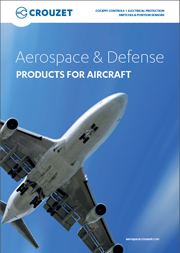 Aerospace products require highly-tailored solutions for demanding applications. Our state-of-the-art production facilities certified to the highest quality standards, ensure that Crouzet products meet the level of performance that is needed in this critical environment. Crouzet is constantly seeking to recognize technology trends at an early stage and to successfully convert them into new product innovations. We regularly organize technology meetings with our customers to share our knowledge and understanding of the future needs and research. vulputate, Sed suscipit Praesent tempus velit, dolor.